With Apple TVs already shipped to preorder customers and now available in most Apple retail locations, we are not surprised to see many Google TV devices being launched. We’ve learned that Sony will be launching their Google TV on October 12th, and now invitations (image below) have been sent out by Logitech for their Google TV launch event taking place October 6th. 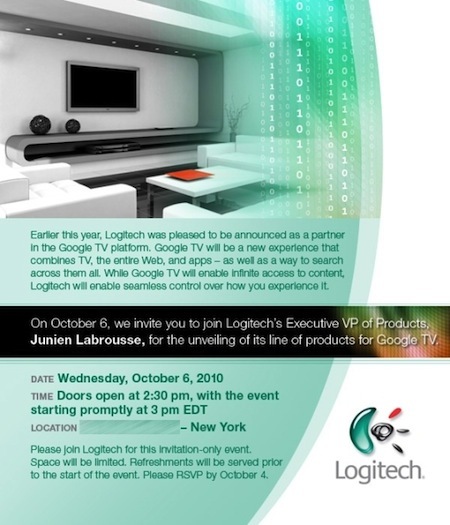 Junien Labrousse, Logitech’s Executive VP of Products, will host the press conference in New York on Wednesday of next week. We will of course keep you posted on any interesting announcements made during the event.